The expression "paying with plastic" may not be an anachronism yet. But the phrase, which describes a routine activity for multitudes of consumers who rely on credit, debit and prepaid cards to purchase goods and services, may be lost on future generations. Rick Oglesby, founder and President of AZ Payments Group LLC, a Phoenix-based consultancy, agreed. "Ultimately that's how it's going to work," he said. "The actual experience of paying will disappear into the background." For decades, plastic cards – with magnetically encoded information, holograms and more recently secure embedded chips – have been key to the payment authentication process. That's all changing with the evolution of mobile technologies like near field communication, growth in ecommerce and the emergence of the Internet of Things. It's not that wholesale changes are imminent. "We've been talking about things like this for at least 20 years," Oglesby said. "It's still going to take time." Industry veteran Robert O. Carr concurred. He recalled an exchange in 1965 with a college professor who predicted punch cards would be obsolete in five years. "Twenty-five years later he was finally right," Carr said. "I believe the plastic card will follow a similar pattern." Carr is founder and CEO of Beyond Inc. "The growth of cards will slow beginning in four to five years, but they will still be used for a couple of decades before they become obsolete," Carr added. Visa stated in the 2017 publication Innovations for a Cashless World, "Innovation in commerce has always been about reducing the friction and providing a better consumer experience." Today, consumers spend upwards of 11 hours a day online empowered by the ability to find anything they need or want within seconds, according to Nielsen. Against this backdrop, "the payment experience slips into the background and becomes part of the overall experience rather than an additional step they need to seek out and complete," Visa wrote. That's the big plus for mobile payments, which got a kick-start four years ago with the introduction of Apple Pay, and now include several bank and nonbank brands. According to Boston Retail Partners, 57 percent of top retailers were accepting mobile payments last year, up from 36 percent in 2016. "That's a huge acceleration," said Jon Rosner, Vice President of Product Strategy for card services at Fiserv Inc. He said that acceleration will continue as more consumers adopt smart phones that support payment apps. Research just released by the Pew Research Center suggests 77 percent of Americans owned smartphones in 2017, compared to 35 percent in 2011. Not surprisingly, ownership is highest among younger adults, with 92 percent of those between the ages of 18 and 29 owning smartphones, according to Pew's research. A consumer trends survey conducted for Fiserv in 2017 by Harris Poll revealed that 13 percent of consumers had used digital wallets during the previous 30 days; 15 percent had used digital wallets within the past year. Rosner, meanwhile, pointed to data from Apple Inc. indicating 74 percent of Apple Pay users think it is a better way to pay than using plastic. 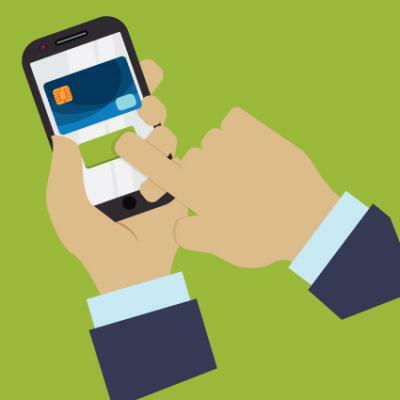 Convenience clearly is a driver of mobile payments adoption, Rosner said. Mobile wallets also address many of the security concerns associated with electronic payments, since all transactions are tokenized. "The level of security is greater than any other form of payment," Rosner added. Despite the optimism, Raymond Pucci, Associate Director of Research Services at Mercator Advisory Group, said there remain factors that inhibit broader adoption of mobile wallets like Apple Pay, Android Pay, Samsung Pay and others. "Mobile shoppers want more integrated features and need more engaging reasons to use mobile payments, but most payment vendors and their merchant clients have not yet provided that," Pucci said. The emergence of smartwatches and other Internet-connected wearable devices may provide some of the additional engagement consumers are looking for. Several of these, including Fitbit, now can be linked to digital wallets and used for tap-and-go payments at vending machines and thousands of merchant locations. Gartner Inc. predicted that 50 percent of consumers in mature markets will be using wearables or smartphones for at least some payments this year. Juniper Research Ltd. expects the global value of mobile and wearable contactless payments to exceed $95 billion in 2018. While that total is just a fraction of the trillions of dollars in annual card-based payments, it's a notable increase from 2015 when wearables accounted for just $35 billion in payments. Both Visa and Mastercard have been working with companies specializing in consumer wearables to support payment functionality. The arrangements leverage tokenization, considered by many to be the safest way to authenticate payments by replacing account information with unique digital identifiers (tokens). "Visa continues to focus on delivering the tools and technologies that empower our partners to offer safe, secure and convenient payments to consumers via connected devices," Visa stated in celebrating the company's support for payments initiated using Fitbit smartwatches. "Consumers today are expecting technology to help them accomplish life's daily tasks with as few steps or clicks as possible," Mastercard Senior Vice President of Commerce for Every Device Kiki Del Valle said of that company's collaboration with Fitbit. Del Valle added that Mastercard is focused on supporting secure payments using any connected devices, from wearables to connected cars and smart homes, too. There is much research to suggest consumers and financial institutions, alike, are ready for these changes. The Financial Brand, which tracks trends in banking and payments, reported that among global financial services executives surveyed last fall, six out of 10 consider removing friction from the customer experience to be the biggest development in 2018. The third most important trend (cited by 42 percent) was improvements in multichannel delivery. Mastercard, which tracks consumer discussion topics on social media, reported in a 2017 study that wearables as payment devices were the hot topic in 2016, dominating 37 percent of social media conversations on emerging payment technologies. Meanwhile, a 2017 survey of 1,000 U.S. consumers by AYTM Market Research found 86 percent of respondents are interested in using biometrics to authenticate payments. Consumers are most familiar with fingerprint recognition, with 30 percent saying they used it once or twice and 35 percent saying they use the technique regularly. Half of those participating in the survey, conducted on behalf of Visa, said the top benefit of biometrics is eliminating the need to remember multiple passwords or PINs. Seventy percent said they found biometrics easier to use, and 46 percent felt biometrics offered more security than passwords or PINs. "For financial institutions, the time has never been better to integrate biometric technology into banking apps and payments experiences for consumers," said Visa Senior Vice President of Risk and Authentication Products Mark Nelsen in discussing the survey findings. "Advances in mobile device features are increasing the accuracy and speed of biometrics, such that they can be used for financial transactions. At the same time, consumers are widely familiar and comfortable with using biometrics for more than just unlocking their phones." The move away from physical cards isn't necessarily bad news for acquirers and their partners, as the bottom line focus remains on facilitating payments. "It's no longer going to be about the card; it's about the customer," Oglesby said. "This presents both risks and opportunities." In October 2017, leading acquirer First Data Corp. launched an initiative with Apple to broaden mobile adoption and get more of its Clover Go tablet-based wireless devices into the market. Clover Go supports contactless, magnetic stripe and chip card payments, as well as a range of merchant apps facilitating, for example, gift card and loyalty programs. First Data claims it supports Apple Pay acceptance at more than 1 million U.S. merchant locations. "Enabling Apple Pay for our merchant clients allows us to offer our clients more forms of payment acceptance," said Dan Charron, Executive Vice President for Global Business Solutions at First Data. Under the arrangement, Clover Go is now available for purchase at Apple stores. Charron said the arrangement provides "a great opportunity to create brand awareness for Clover Go devices, which we expect will benefit all of our sales channels." The transition away from plastic cards to initiate payments isn't just a consumer phenomenon. It also is helping to prod greater use of card accounts to facilitate business-to-business (B2B) transactions. Despite the proliferation of electronic alternatives, checks remain a dominant fixture in the B2B payment space. A 2016 survey by the Association of Financial Professionals found that more than half of all payments by U.S. businesses continue to be made by check. Several factors contribute to business preferences for checks, including costs (checks don't carry interchange) and the need to exchange and reconcile payment and invoice information on the back end. But the market is beginning to change. Nick Babinsky, Director of Business Development at Billtrust, said B2B payments from card accounts are "exploding," thanks in part to innovations around virtual cards, which are one-time use, auto-generated card numbers that buyers can send to suppliers to effect payments. Billtrust has developed a product dubbed Virtual Card Capture, a cloud-based solution that embeds payments and remittance data into a single secure file to eliminate manual keying and optimize interchange. Buyers initiate transactions directly from their accounting systems; funds get deposited to biller accounts and matched with open invoices automatically. "This keeps the buyer really safe and makes reconciliation easy," Babinsky said. Billtrust isn't going it alone. The company is working with Visa, which has made a strategic investment in Billtrust, according to a recent joint press release. Virtual cards aren't just good for businesses. Babinsky said opportunities exist for greater adoption in consumer markets, too. "Virtual cards for consumers make a lot of sense," he said. It's not just the plastic form factor that's destined to change in the ongoing evolution of card payments. Familiar cues of the checkout process may be changing, too. Visa said it plans to test a new sensory branding campaign during the upcoming Winter Olympic Games in South Korea. The tests will involve sound, animation and haptic (vibration) cues that will signify completed transactions in digital and physical retail locations. "As payments become increasingly embedded in commerce, the notion of 'Everywhere You Want to Be' [Visa's tag line] takes on even greater meaning for our brand," said Lynne Biggar, Executive Vice President and Chief Marketing and Communications Officer at Visa. "As new payment experiences continue to take shape in the world, this suite of sensory branding elements will give consumers the assurances we know they want every time they use Visa." Visa said it has done extensive research that shows consumers like the idea of sensory branding. Among the findings: 83 percent said sound or animation cues would positively impact their perception of the Visa brand; 81 percent said they would have a more positive perception of merchants who used sound or animation cues as part of the payment process. Visa also said it is working with "national merchant and point-of-sale hardware vendors" in support of sensory branding, and software development tools will be made widely available this year for payment services providers and merchants to start implementing sensory branding. What makes an MLS valuable? Moving merchants: Great support or biting the hand that feeds?